Notice the bottom picture, the way the center of the plate is toed to the outside of the boot, not centered? Your plate is centered, it wants to be offset to the outside, this is causing you to be off balance, and would definitely effect your foot cramping. there's lots of info here on the log about mounting roller skate plates off-set, do a little searching, ask some questions, hopefully, it will be a fun project. Plate alignment depends on several things. Based off your picture there,...Why have to pigeon toe /edge your skates to roll straight? Last edited by Mort; August 2nd, 2018 at 10:04 AM. Two things come to mind on your question: boots aren't snug, causing you to clench your toes when leaning, causing cramping. If your boots are allowing any movement of your foot inside of them, start there. Generally, skate boots run at least a half size smaller than street shoes. This is why folks have trouble in rentals; they don't come in half sizes, and the skaters aren't instructed in proper lacing techniques. Lol, careful about "second skin" though. There is a member here who thinks lotions , and the lack of friction between boot and foot to be the best idea ever. After a break in period, maximum friction causes no slip, and bonds a skate boot to your foot. Like a second skin but what do we know? I had another great 2.5 hour session at the rink today. I relaced my skates using the over-under pattern and loosened the kingpins quite a bit...what a difference! I really feel like I’m getting close to getting these skates dialed in. I would loosen the kingpins a bit, then skate for 20-30 minutes, getting used to the looser kingpins, then repeat. I loosened them 3 times and they really are turning well now. I only stopped to rest 4 times, and it was my legs not my feet that were tired...yay! Usually SG Super cushions in purple are the same as the stock cushions in those plates, but a bit better quality as rebound goes. Today, at the rink, I loosened my kingpins all the way...to the point where they would be sloppy if I loosened them any more. I really like how they feel loose, but I think I might be ready for softer cushions. In looking at these, are the yellow the next softer set? As always, thanks for the advice. Mort's list is correct. The higher the number associated with a cushion the harder it it. So, the hardest is red and the softest is blue. p.s. You can mix colors to fine tune the action to your personal preference. I run blues on the front kingpins and yellow next to plate with blue closest to the axle. Result: slightly less turning with back axles. Great! I’m going to pick up a set of yellow and see how they feel. I have a question. Why is your plate centered in the middle? Did you buy it like that? And if yes, where did you buy it? You can mix colors on all skates, but on 30/45 degree Kingpin plates it will affect stroke finish. If you know what you are tuning for on your stroke, you will be mixing them for that affect. The local skate shop mounted it like that when I bought them. Are they not supposed to be mounted this way? Some how I missed this post earlier...is this true? 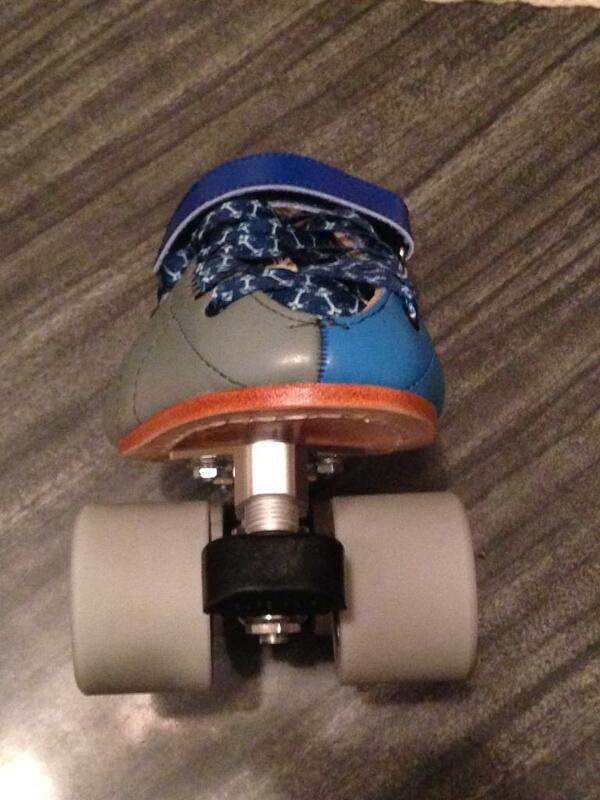 Are my skates mounted incorrectly? Yes, I truly believe the mount is incorrect. I recommend that you send them to Skates US and let the professionals mount them properly. They charge about $30.00. Easy and quick fix. Edit to add a link to Skates US. They are really terrific people and can help with anything, not just Edea skates or Roll Line Plates. They are a service shop as well.